This article revisits some of the issues raised in that publication; the main theme is the ongoing conquest of public space, based not so much on ownership as on the power to encode meanings. The mechanisms of this power, unlike the laws arising from ownership, are not widely recognized by society. This form of authority has gone almost entirely unnoticed by the general public, and therefore has also evaded any sort of civil supervision. It is a contemporary form of appropriation of public space that is fundamentally different from the familiar historical phases of political and economic ideologization. especially of 20th-century socialism – all these are displays of power based on the clear manifestation of ownership and permanence in terms of both matter and meaning. The new public spaces are characterized more by impermanence, a capacity for rapid re-coding, dividing and sub-leasing, and a functional flexibility. Their roles, status, and internal and external interrelations depend not on material ownership, but on how they are managed. These features find an architectonic expression in the concept of the virtual facade, programmed to respond flexibly to the changing data flow and to interact with the surrounding informational environment. Since the beginning of the 20th century, the departure of art from the confines of the gallery has been one of the factors steadily influencing artistic practice. There is a whole gamut of sometimes-contradictory reasons why urban space – both material and symbolic – has steadily attracted artists. Some of them are its qualities as an exhibition space, which are such a contrast to gallery conditions: the different scale, the different visibility, the different emotions. It is a space in which one can gain renown; a space to fight for and to fight with; a space to represent, interact with and theorize about. Contemporary art sometimes craves all of the above at once – but currently the most important craving seems to be a wish for direct confrontation with the illusions, symptoms and codes of social order. 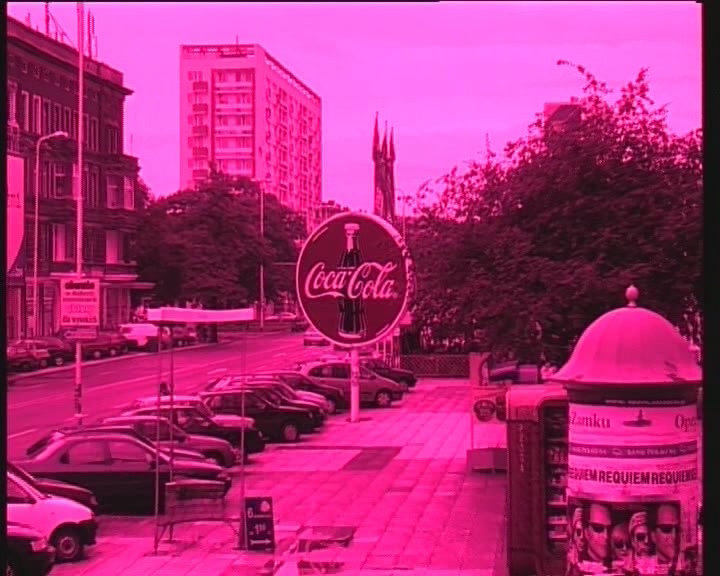 Artists are dealing with a reality in which the contemporary concept of public space has broadened to include its symbolic, virtual and post-technological aspects – and at the same with the traditions of 20th-century art, which compelled artists to constantly criticize the creative process, their work, the act of perception and changes in their relationship to space. So although public space, especially in central locations, is sometimes still tyrannized by newly-erected monuments purporting to represent, as in days of old, History and Memory and all that, that type of pompous display of art in public places is more and more infrequent, more and more anachronistic, and more and more inept at fulfilling the symbolic function it is trying to lay claim to. Nowadays placing permanent memorial monuments in urban space generally has neither artistic nor social significance. Public space is an actualization of the concept of the public sphere, which is entered into and shaped by citizens who can ponder public issues and establish laws as needed. This idea, which arises from imagined ancient forms of direct democracy, is currently giving way to an awareness that even if all kinds of ideas and opinions can be raised and discussed, not every voice will have the same political and economic weight. The public domain is a conglomeration of many different layers at different stages of development, in open and closed physical spaces, media channels, forms of communication and of cultural expression. The public sphere is in itself neither benign nor democratic; in place of dialogue, it offers communication and consumerism, mechanisms for manipulating mass behavior and emotions, and also – in the name of common security – for surveillance and control. The panopticon that Foucault wrote about was just a foretaste of the contemporary hyper-visibility made possible by the technology of biometric scanning and automatic tracing. Media technologies play a fundamental role in the current process of organizing and allocating the urban public sphere, but at the same time, they introduce an element of instability and changeability that offers continued hope for the democratic potential of public space. 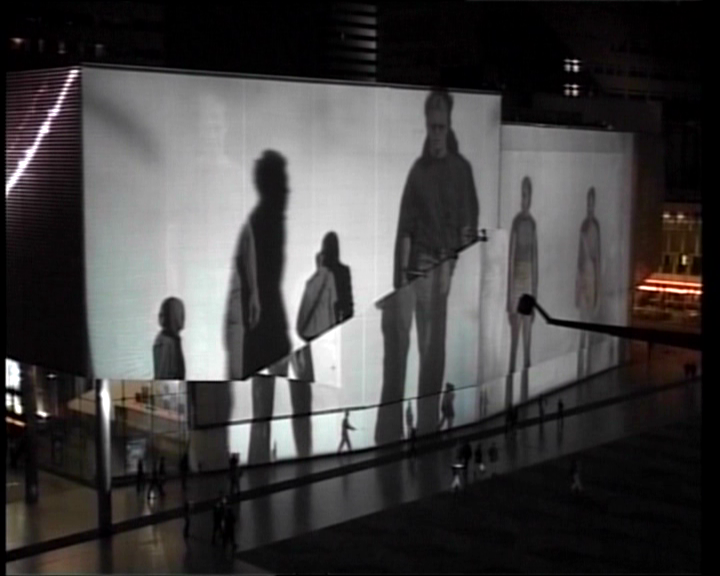 Many artists therefore view it as their role to raise awareness of the difference between freedom on the one hand, and the ideological or industrial formatting of aspirations and behavior on the other; and so they are undertaking to redefine and recultivate urban space as a common domain. This is why the issues of liberty and control, presence and visibility, communication and representation, and empowerment versus exclusion recur so frequently in the works of urban-space artists like (to mention just a few) Jenny Holzer, Barbara Krueger, Rafael Lozano-Hemmer, Krzysztof Wodiczko and Józef Robakowski. 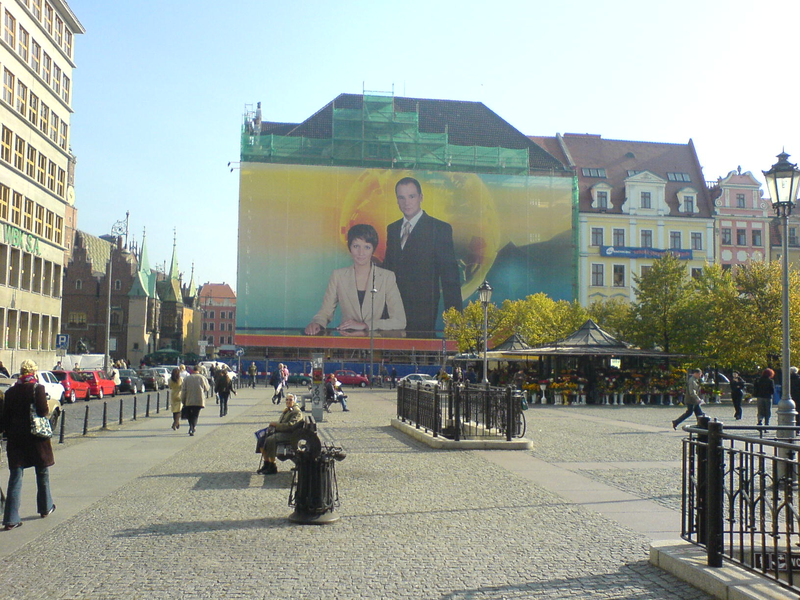 The two accompanying photographs from Wroclaw and Gdansk, taken at almost the same time in the traditional “cultural/historical landmark” areas of those cities, highlight a different, newly developing process of monumentalization: the monumentalization of advertising space. The photos show how the historical matter of these places is being covered over with huge colorful surfaces. 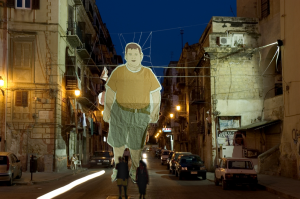 If the municipal authorities decided to place works of contemporary art of a similar size in these same areas, it would certainly result in considerable discussion, or even major outcry, from opinion-makers as well as ordinary citizens protesting such a sullying of tradition and history. So it is all the more striking to see these monumental advertisements being tacitly permitted by the people in these spaces, despite the blatant visual oppression that they are subjected to. An analysis of the nature of this permission would be very worthwhile, and could also reveal some of the new mechanisms of contemporary consciousness, which treats the world as an advertisement and/or a product, but at the same time employs an economy of attention involving various strategies for non-noticing. In any culture, the boundary between what is perceived and what is not always depends on the intensity of the stimuli. Contemporary economics require advertisers to remain constantly in the field of perception – to be visible at all costs – and this leads directly to gigantic advertising formats. It is difficult for art to employ a similar strategy, since it requires heavy financing. Things have changed since 1909, when Marinetti could publish his Futurist Manifesto on the front page of Le Figaro; nowadays the problem of costs and sources of funding is crucial to the presence of art in public space. Artists seldom have the opportunity to create monumental messages. One of the only centrally located and monumentally proportioned artistic acts of the late 20thcentury was the wrapping of the Berlin Reichstag by Christo and Jeanne-Claude. It was a work laden with rich and reflective allusions, poised in an extraordinary moment in between history and the future, its impermanence highlighting the uniqueness and appeal of the present. 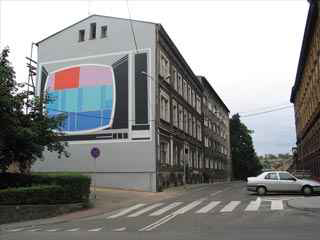 Another play on advertising references is found in Monika Sosnowka’s Rubin (2004), which occupies a side wall of a Warsaw tenement building. 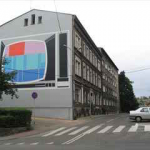 It shows a Soviet-made color television, which a few decades ago was a highly sought-after commodity. This pseudo-advertisement, irrelevant to the present, in praise of a product no longer on the market, accurately conveys the peripherality and backwardness of the urban space in which it appears. 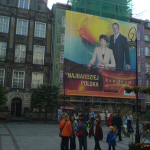 The period of political/economic transformation in Poland began with the demonumentalization of the central urban spaces. This was manifested symbolically by the dismantling of statues: every town had some kind of memorial it wanted to get rid of. But the practical manifestation was the fragmentation of space taken over by the sudden surge of trade. The floor space in state department stores was chopped up into tawdry little parcels and rented out piecemeal to small merchants. Hundreds of kiosks and booths sprang up, all with their signboards and placards, haphazardly filling up formerly stately spaces that had until recently been reserved for governmental ceremony and ritual. This transformation took place rapidly and spontaneously, and then settled in for a lengthy period. But of course the metabolism of these spaces didn’t cease; gradually, the emergence of the corporate economy was heralded by the proliferation of billboards: rented advertising space commanding attention through its sheer size, previously unknown in these parts of the world. Amid all the free-market chaos and uproar, no clear artistic strategy regarding the new reality appeared. 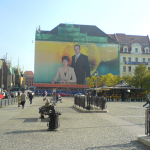 But by 1998, the infrastructure of the network of billboards had become organized and was centered mainly in the hands of a few agencies specializing in outdoor advertising. And that year, one of these agencies – AMS – agreed to launch a project called the Outdoor Gallery. 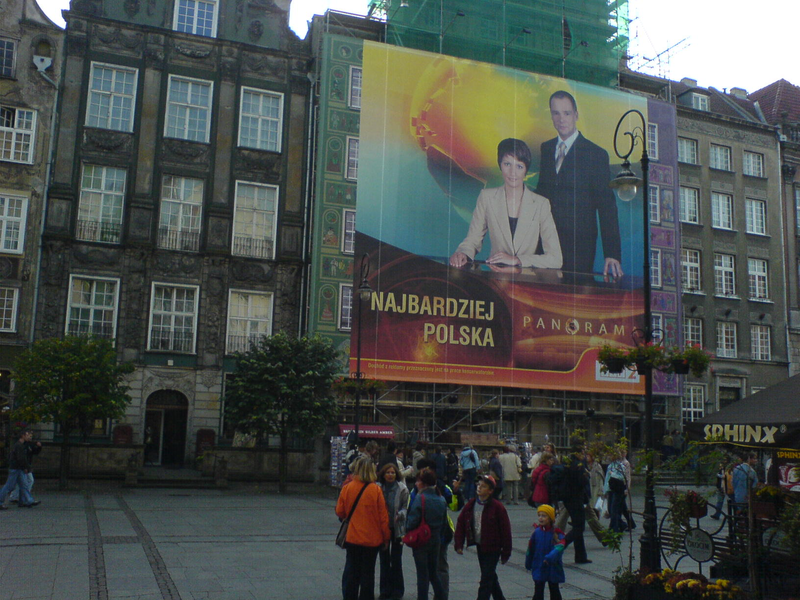 The works produced for AMS were displayed network-style, like advertisements, on 400 billboards at a time throughout Poland, so that the presentation had many of the features of an advertising campaign. 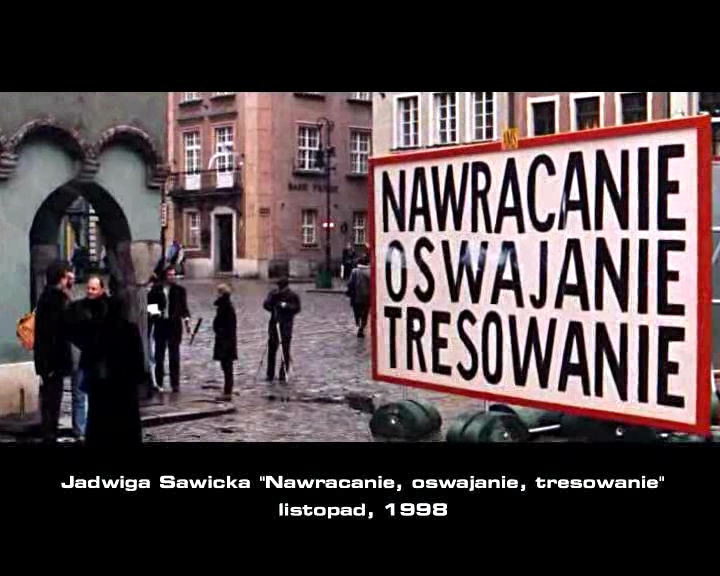 Many of the artists participating in the project – for example Paweł Jarodzki with his Kto nie kupuje ten nie je (If You Don’t Buy You Don’t Eat, 1999) – alluded very directly to advertising and consumerism, and thus to the peculiar context created through the use of the advertising infrastructure. 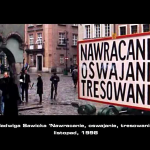 But some of the works – for example Jadwiga Sawicka’s Nawracanie Oswajanie Tresowanie (Conversion Taming Training, 1998) and Katarzyna Kozyra’s Więzy Krwi (Blood Ties,1999) – carried a disturbing cultural load that went beyond the direct subversion of references to advertising. “What signs fail to express, their application shows. 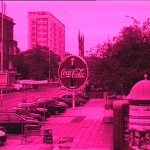 What signs slur over, their application says clearly.”↓ 6 The video shows one of the most recognizable symbols in the contemporary world – the Coca-cola logo – revealing and obscuring the surrounding scene as it revolves. The symbol and meaning, context and use that Wittgenstein speaks of are deftly presented and interpreted in urban space, where a multiplicity of signs – the whole contemporary iconography of assorted logos and trademarks – is mixed in with cultural symbols and traffic signals. Signs and symbols appear in their assorted applications: they regulate, they persuade, they inform; they also have seemingly neutral functions. Their presence can be ambiguous, inconspicuous or intrusive. Video is an especially apt tool for describing and diagnosing this, for revealing meanings and codes hidden beneath the surface. As cameras become ubiquitous, their work is ceasing to attract attention or disrupt normal activity in communal space. We’re getting used to cameras being present almost everywhere – small and unobtrusive, so commonplace that they become invisible, filming away in private hands and in countless institutional systems for surveillance and control, non-invasively penetrating reality. 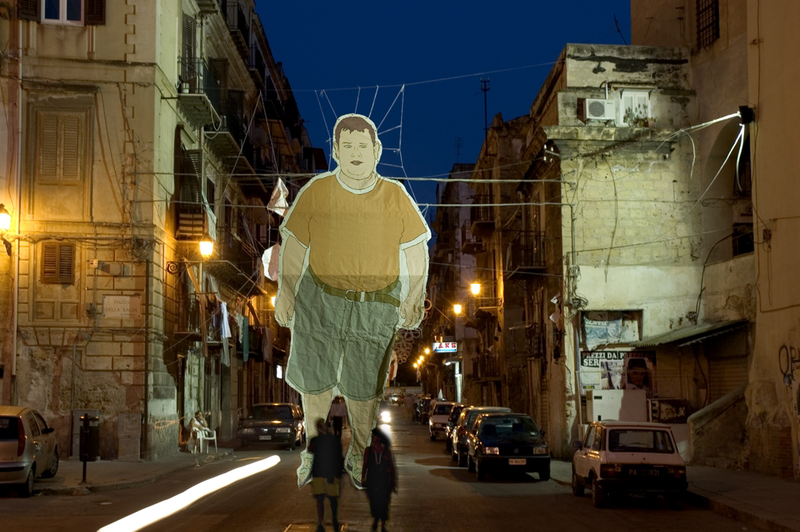 Public space attracts artists – but has art invaded that space on anything like the scale one might expect, judging from the proposals and manifestos being published for nearly a century? Are artists and their works particularly present and visible in that space? If we consider all the indications of the presence of artists and activists as a whole – murals, tags, stickers, stencils, every vital sign of authorized or unauthorized culture that appears in public space either with or without permission – it is still only a marginal part of the current iconosphere dominated by industrial mechanisms for the manipulation of consciousness. Every space formed in the past becomes worn out over time, and needs not only material renovation, but also new content: revitalization in a larger sense. Otherwise it becomes marginal and peripheral, abandoned by dynamic forces. It loses its attraction and becomes part of the landscape of exclusion. Art can find a very interesting role to play in just such places. But that doesn’t mean it has nothing to achieve in areas that are blooming and developing, in places of prominence.